Their first delivery took place in New Zealand – but a Russian company says they got there first. The drone delivers its hot, edible cargo. DOMINO’S HAS BEGUN delivering pizza by drone, after its first successful test flight took place in New Zealand. The order, for a piri-piri chicken pizza and a cranberry chicken pizza, took place at around midnight last night, Irish time. 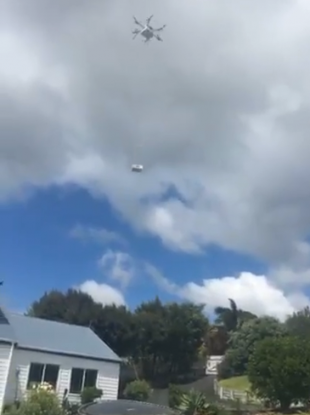 “It’s been made fresh in store, loaded to the DRU drone and delivered here autonomously to the customer’s house,” Scott Bush, general manager of the Domino’s Whangaparaoa store, said in a promotional video. “Keep an eye on the sky, the first delivery’s on its way. The footage then shows the drone wafting over the house, and slowly lowering its cargo to the customer’s spacious front lawn. The two occupants, a man and a woman, emerge from the house and collect their fast food. A spokeswoman for Domino’s Ireland and UK told TheJournal.ie that there are no plans to roll out the service here, however. A Russian pizzeria, meanwhile, has disputed the claims by Domino’s New Zealand to be the first to deliver pizzas by drones. In a statement to TheJournal.ie, Dodo Pizza said they did so back in 2014. Their deliveries were not the first ever commercial pizza deliveries by drones. Dodo Pizza performed genuine commercial deliveries over two years ago, in June 2014. Following feedback on its Facebook page, Domino’s New Zealand rejected claims that the drone deliveries service would result in layoffs, or reduced job opportunities. “We welcome DRU Drone by Flirtey into the team as we do with any new staff member,” the store said in a statement. It added that they are always looking for ‘delivery experts’. In response to customer comments, Domino’s also said that the drones will initially operate at a distance of 1.5km from stores, but would expand to a radius of 10km. “Our DRU Drone also has camera footage,” it said on its Facebook page. “Our partner, Flirtey, has worked with the office of the privacy commissioner in New Zealand and actively participated in developing voluntary best practices for UAS privacy, transparency, and accountability in collaboration with the National Telecommunications and Information Administration in the United States. Let us be clear, we record in-flight footage only for the purposes of reviewing in an incident, otherwise it is wiped. “The trial process has been designed to thoroughly test the quality of the product and ensure our high standards have been met,” Domino’s added. The company said it will is monitoring whether the new service meets quality and health and safety considerations. Safety, and the quality of our products arriving to customers safely is our number one priority throughout all stages of testing and launching pizza drone deliveries. Domino’s said its DRU drone delivery partner Flirtey received a Part 102 unmanned aircraft operators certificate from New Zealand’s Civil Aviation Authority. In Ireland, drones fall under the jurisdiction of the Irish Aviation Authority (IAA). Last year, the IAA brought in measures requiring drones weighing 1kg or more – and the owner’s location details – to be registered with an online terrain mapping system. Drones weighing over 250 grams will also need to be registered under EU proposals, which are expected within the next two years. The existing regulatory framework is on the IAA website. Email “VIDEO: Domino's has begun delivering pizzas by drones”. Feedback on “VIDEO: Domino's has begun delivering pizzas by drones”.